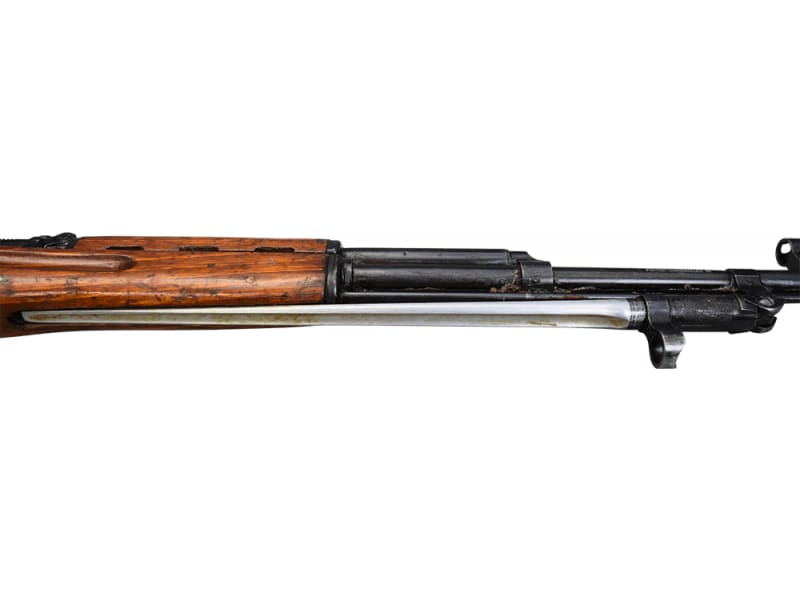 Original Chi-Com Vietnam Era Military Surplus Type 56 Chinese SKS Rifles Manufactured at the famous Jianshe Arsenal #26 7.62x39, semi-auto. Includes 10 round box mag and spike type folding bayonet. Well used and will show their history but highly functional and very cool! These are military turn ins so expect some battle scars. Stored in heavy cosmoline. Update 04/17/2019 : We only have a small qty of rifles left from this batch and they are all more battle worn than the original median average. All are still very functional but expect heavy bluing wear and rough stocks with digs, dings, scratches, gouges and possibly even a non function inhibiting crack or two in the stock. All have been dry run checked for function but we do recommend following the safety protocol in red type in Brutus Description Below. Prices have been reduced to reflect condition and no hand selects or custom options will be offered on these remaining rifles. See Brutus description and video for full details on original lot. . These Rifles Are C & R Eligible. 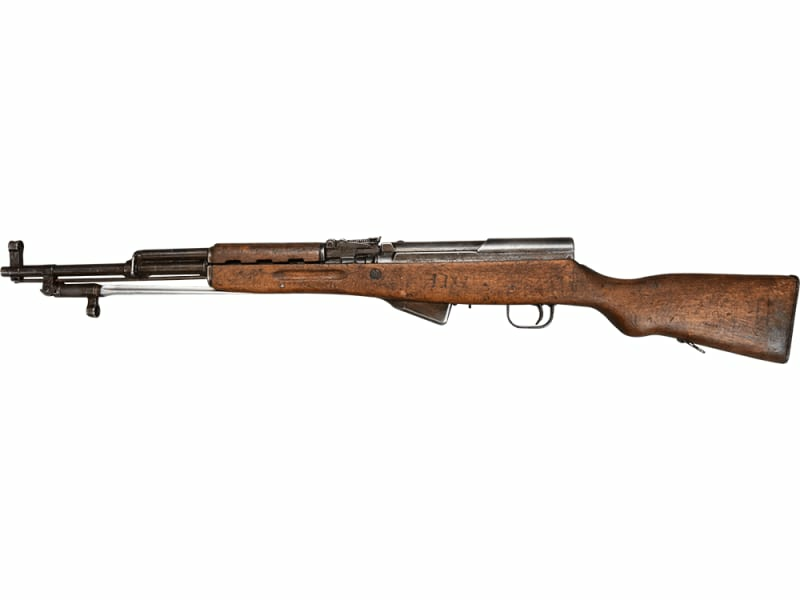 How To Clean, Disassemble and Reassemble a Chi-com SKS from Classic Firearms on Vimeo. We will select the best 1 out of 5 for exterior cosmetics. However. this does NOT guarantee any specific grade or condition rifle. The rifle will still be ugly as all of the Chinese SKS rifles are ugly. Unlike most surplus guns, these have NOT been through a refurb process. The only parts we check for all matching (if you selected this option) are.....1) receiver, 2) bolt, 3) dust cover, 4) trigger guard, and 5) mag well. Prices have been reduced to reflect condition and no hand selects or options for custom characteristics ( i.e. milled triggers etc... ) will be offered on these remaining rifles. Many of the rifles will still have the custom option features however with thequantity remaining we just can't guarantee for those. What A Find. These historic and highly popular Chi-Com rifles were banned from importation by the Clinton Administration in the early 1990's. 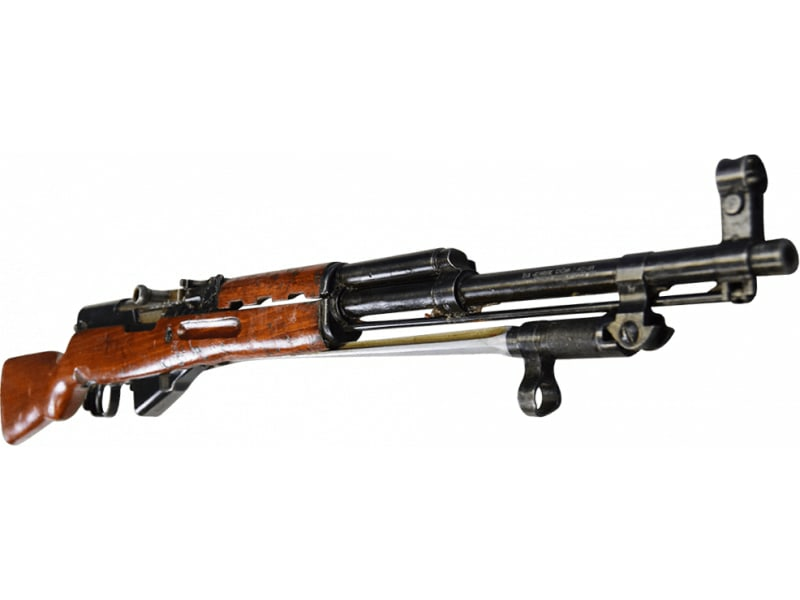 This small group of rifles was stored in a neutral country for over 20 years before being granted an exception for import and are now here at Classic Firearms for sale to you. Rifles have been stored in heavy cosmoline ( no extra charge for that ) and as such are well preserved but will be in Turn-In condition. 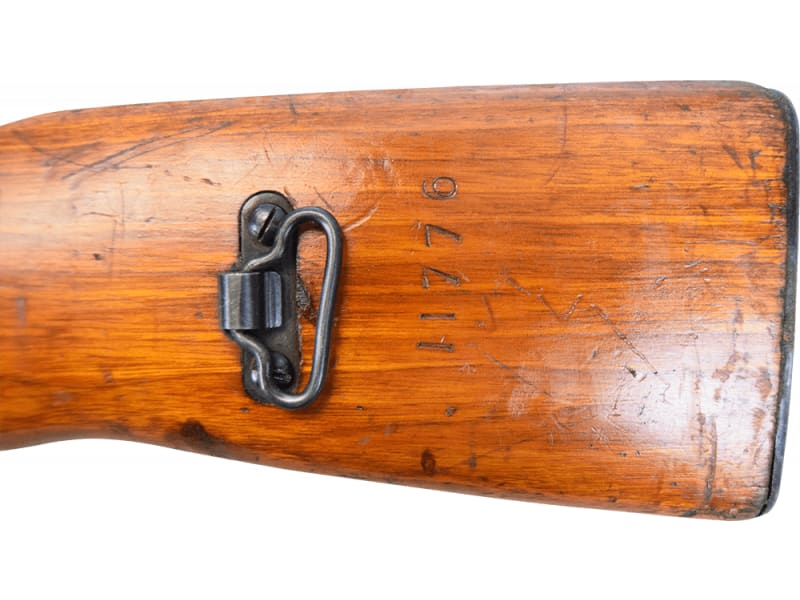 Rifles are complete and functional but expect varying degrees of bluing wear ( some heavy, some less ) , and stocks with dents, dings, scratches, digs, gouges, and discoloration from service use, handling and storage. Further concerning the stocks, most stocks are solid but some may have small cracks and / or in some cases even a little trench art. We have not found any that are broken or unsafe to use as these have all been sorted out by the importer. You can expect a good solid shooter, but in most cases, not a really pretty stock. However we have done a thorough inspection on these and there are a lot of exceptions to that rule as many are quite nice so the the cosmetic condition is pretty much all over the place. I even found some that looked darn close to being unissued with really nice stocks and 100% blue, but those were the exception... not the rule. Overall I would say that these guns average about 80% of new condition cosmetically. Now I like the way they look overall and many are actually pretty nice but to be clear, and so nobody can say we didn't represent them properly, there are a number of ugly stocks in there so expect an ugly stock. Same goes for the bluing however to a far lesser extent. We have seen some guns with excessive bluing wear but I would say that is the exception as most of these guns are running 80% plus in the blued department with many being closer to 100%. The good news is we did not see any rust on any of the rifles ( at least above the stock line ) and due the the amount of cosmoline on them, I don't think you will. We do offer a hand select in which we will pick the best of 10 from any particular group. Now remember, the more rifles that sell, and the more hand selects are drawn from the lot, the lower the standard for the hand select will be even though it will still be the best of 10. As such, the early bird gets the worm so to speak on the best of the hand selects. Some stocks may possibly have trench art (field carvings) in the stocks as represented in one of the images above. We are not disqualifying these carvings from hand selects as these are prized by some collectors and many consider this field art extremely desireable. We also do not dis-qualify a slight repairable crack in the stock from qualifying as a hand select as the rifle may be head and shoulders above the others in it's group otherwise. I had the opportunity to be a part of the inspection on these rifles and every rifle has had the bolt cycled and the trigger pulled to check for dry fire function. I have no doubt that all of these rifles will function properly. However, as with all surplus firearms it is important to follow all safety protocols before firing. Important Safety Warning - Please note, as with any surplus firearm we advise that you have the rifle inspected by a competent gunsmith before firing. In addition all cosmoline needs to be thoroughly cleaned from the rifle... especially from the bore, the gas system, trigger group and the bolt group and special care needs to be taken to insure that the firing pin moves freely within the lower bolt. 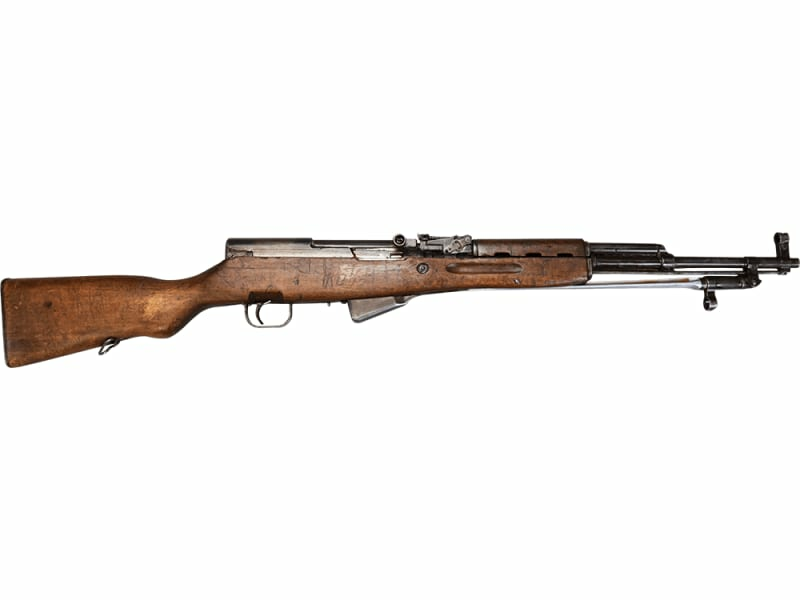 SKS rifles are designed with a Free Floating Firing Pin and as such can be prone to Accidental Discharge or " Slam Fire's " if the firing pin should happen to get stuck in the out position. This can occur due to the firing pin being rusted and stuck in the out position or due to the channel containing the firing pin getting clogged with any type of dirt or debris that would prevent the firing pin from moving back and forth freely within the lower bolt. Even heavy cosmoline within the bolt body can clog the firing pin channel preventing the firing pin from receding back into the bolt face quickly enough thereby causing a discharge upon the chambering of a round. As such, it is very important to not only clean the lower bolt thoroughly before firing but also to keep a check on the lower bolt to be sure that the firing pin is moving freely back and forth within the bolt body. Also, as with all firearms, always chamber a round in a safe direction and never point your firearm at anything you do not intend to shoot. 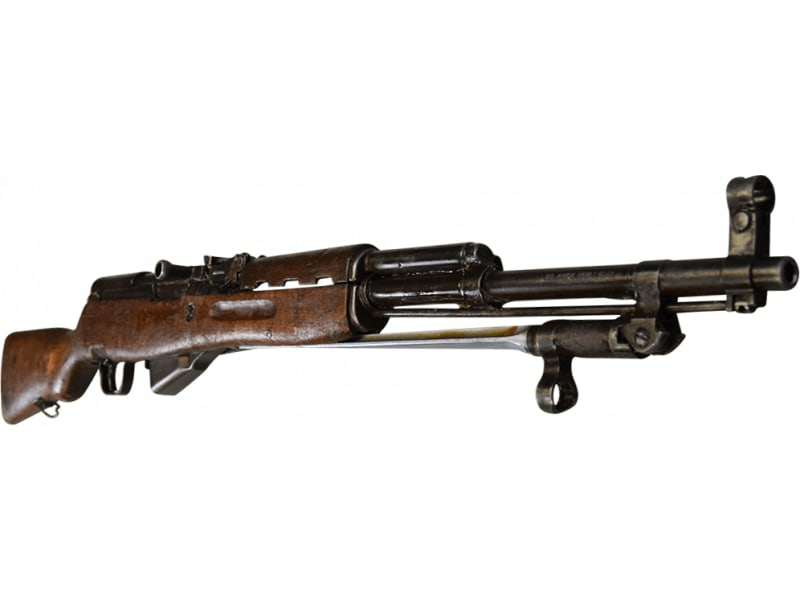 As original early military rifles they contain Mil Spec parts based on the manufacturing protocol in use by that particular military contract factory during the time period that they were produced. All of these rifles have a barrel lug which can be seen between the rear sight and the receiver indicating that they are threaded in rather than pinned in barrels. In addition , most of the trigger groups are milled ( from my observation around 70% ) but some are stamped. While there is no practical difference between the function of a milled trigger and a stamped trigger many people consider the milled trigger groups to be superior quality and as such in addition to a hand select for cosmetic, we also offer a hand select to insure a milled trigger. Most that I have seen have a cleaning rod however we do not guarantee a cleaning rod unless you choose a hand select. All will have a folding spike type bayonet. 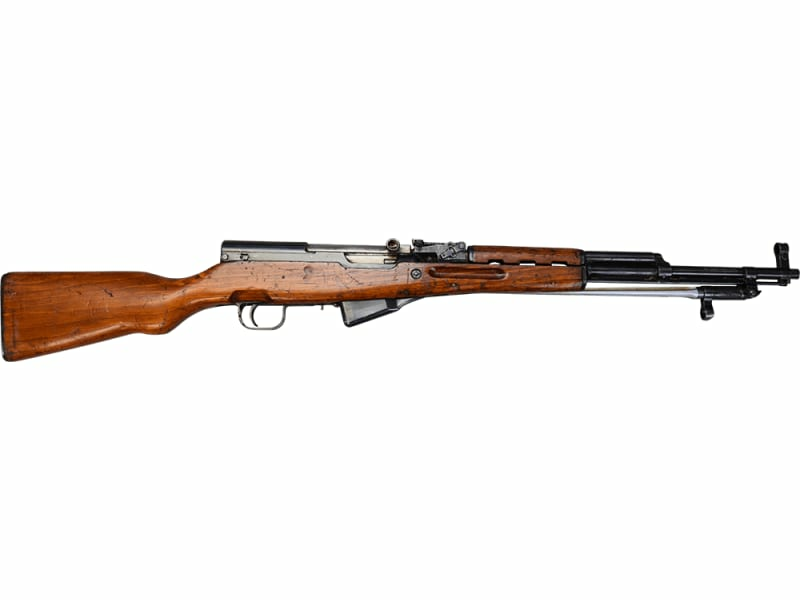 The SKS rifle fires 7.62x39 ammunition from a 10 round box magazine but detachable high cap mags are inexpensive and very easy to obtain. When we first started in business in the late 80's we sold thousands of Chinese SKS rifles and as such I have a soft spot for them. They will always be my favorite. After market stocks, magazines and accessories are plentiful and easy to install, and they are just plain cool guns. Don't let my overly honest description fool you, I have intentionally been hyper critical and have tried to paint a worst case scenario because we want to be brutally honest as to the worst possible case scenario and we do not want to deal with returns due to not meeting your expectations. We learned a long time ago that even though we tell folks that any rifle is a well used surplus former military rifle that has been drug through the mud and the blood, they still somehow expect to get a brand new Belgium Browning. As such, we would rather portray the worst case and have you pleasantly surprised upon receipt than vice versa. In truth, I really like what I have seen in these so far, and I think that as long as you know going in exactly what they are, that you will be pleased with them too. Thus the super long description. All of the guys on staff have seen these and commented about how much better these look than the small group we had a couple of years ago, and how they think folks will be even happier with these, and these guys are all shooters and gun nuts.... that is always a good sign. 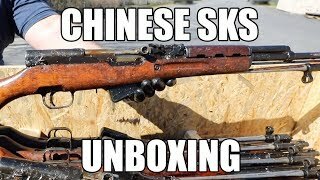 I encourage ya'll to get one or more of these Chinese SKS's before they're gone. It will probably become your favorite rifle. 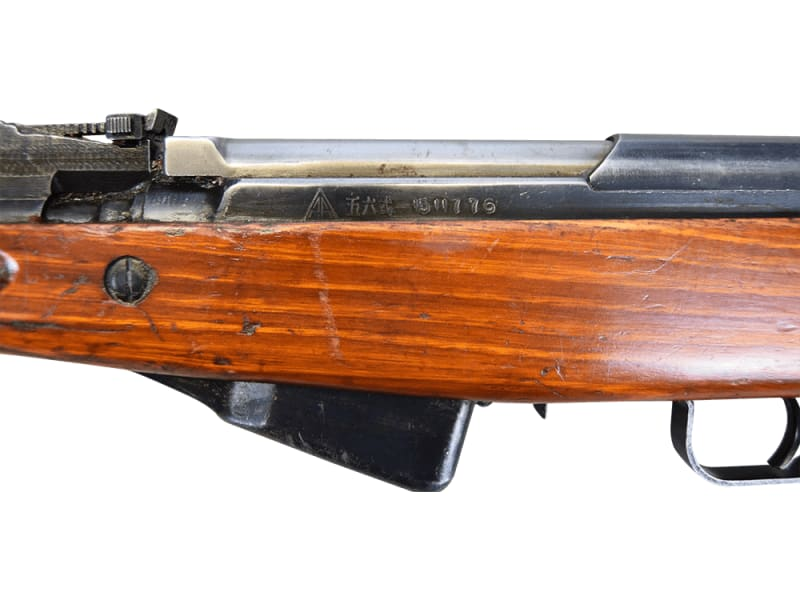 Original Military (Type 56) Chinese SKS Rifles 7.62x39 , Semi-Auto, All Milled, Includes 10 Round Box Mag and Spike Type Folding Bayonet.